This prize medal came up in a Google search for something on Sunday. I've always wanted to find prize medals won by my ancestors but it's not happened yet though perhaps they didn't win anything that came with a medal. This prize medal is made of silver and set in an ornate frame. 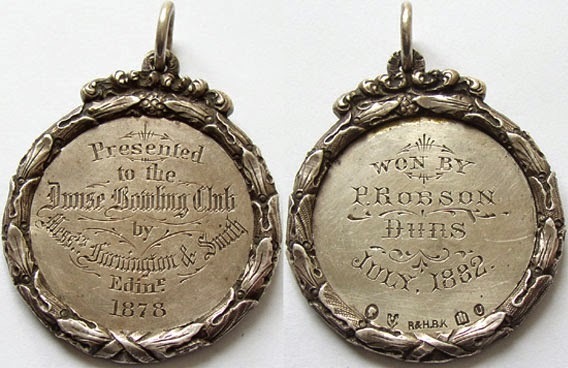 On one side it says "Presented to the Dunse Bowling Club by Messrs Farrington & Smith Edinr 1878". on the other, "Won by P. Robson Duns July 1882." with some hallmarks. He's not in the Duns Monumental Inscriptions volume and I wonder who he was and where he was buried. Was he one of your ancestors ? If you're interested in acquiring it, it's offered for sale by Alnwick British & Colonial Coins & Tokens at £50.